Jacqui McPhillips wanted to purchase a small hotel but only if it was something very special. When she walked onto the beach at Tuckaway Shores Resort in Indialantic By the Sea, Florida, she knew she'd found it. Just minutes from the touristy, high-traffic areas just to the north, McPhillips found Tuckaway Shores Resort sitting right on an unbelievably secluded and tranquil beach perfect for travelers looking for a return to a simpler time and a more personal lodging experience. "Tuckaway is representative of authentic or old Florida style. We are independent, small and owner/manager operated, so there is a more caring attitude about the guests having a more unique experience than just a place to stay. This is the same type of attitude that permeates all of the Florida Superior Small Lodging properties. This may not be the same attitude for all independents, but it is of the Florida Superior Small Lodging member properties," Jacqui told us. Tuckaway Shores Resort is an immaculately kept, three-story hotel located on beachfront property in Indialantic By the Sea south of Cocoa Beach and Melbourne Beach. We're not exaggerating about the quality and cleanliness of this hotel! Tuckaway Shores Resort has won the Florida Superior Small Lodging White Glove Award for exceptional housekeeping and is also AAA certified. "Indialantic By the Sea is a very small beach community adjacent to Melbourne Beach. The community prides itself on being somewhat throwback to a by-gone era when life was more simplified. The community does not welcome 'progress' or the building of high rise structures that block the view of the ocean. They honor the small business rather than chains of any sort and have relatively few chain retail stores and only one chain restaurant. All others are locally owned and managed," Jacqui explained. Everyone is welcome at Tuckaway Shores Resort. Families, mature travelers and LGBT travelers have all vacationed here and, more importantly, have shown their satisfaction by returning again and again. "Families that stay at Tuckaway Shores have voiced their appreciation that the beaches are so kid-friendly with no rocks and more open space for the kids. Many dads have commented that they like the family-friendly atmosphere of the entire area compared to areas offering more nightlife and apparent “seedy” atmosphere found in many beach communities. Moms have expressed their feelings that our area and Tuckaway Shores feels safer for them and their kids," Jacqui said. "Tuckaway Shores offers mature travelers a more relaxed atmosphere away from the hustle bustle. The staff of Tuckaway enjoys interfacing with the guests and more mature travelers often times seem to enjoy having conversations with the staff," Jacqui added. As a gay, married couple, we felt perfectly at ease and immediately welcomed and accepted by Jacqui and her staff. "We have had gay couples stay with us at Tuckaway Shores. Everyone is welcome here," Jacqui told us. The three floors of two-room suites offer something for every taste and every need. The spacious suites feature nearly twice the space of a traditional hotel room with their separate living and sleeping areas. Every suite includes fully appointed kitchenettes so guests don't have to eat out every meal - unless they want to. Each suite offers central heating and air conditioning and free wifi. Ocean front suites have a 180 degree view of the ocean. First floor suites offer a private patio with lounge and sitting chairs. Second floor suites offer private balconies with two chairs. Third floor suites offer a 9 foot wide European, folding glass door system and Juliet balcony. The view is phenomenal. Need some R and R, but only have time for a few days at the beach? If you can stay two or more ”week days” (Sun. thru Thur.) anytime between July 7th and Dec. 15th and book a new reservation no later than July 15th, mention or use Promo Code “WK2″ and we’ll give you a Twenty (20%) percent discount”. Book onlilne or call 800-820-1441 any time between 8am and 9pm. $99/night ocean front or $90/night ocean side plus tax. Rate offered for weekday stays only; no weekend discounts unless by special arrangement with front office for long stays. (Show government work orders or reason for business visit at check-in). All specials, discounts and package rates can not be combined with other specials/discounts and excludes holidays and special events. If returning customers are a sign of success, then Tuckaway Shores Resort is very successful. "I’ve found that once a guest stays with us and returns to our area, they return to Tuckaway Shores," Jacqui told us. 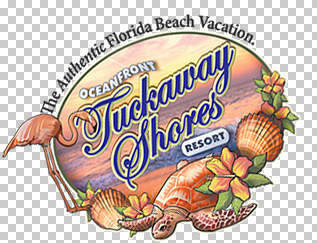 We highly recommend Tuckaway Shores Resort in Indialantic By the Sea, Florida.